Bolivian Vice President Álvaro García Linera first became passionate about politics during the widespread resistance to the Hugo Banzer dictatorship in 1979. Soon after, he left Bolivia to train as a mathematician at Mexico's National Autonomous University, where he was active in the Central American solidarity Movement. Drawn to sociology, he began reading everything he could in an effort to analyze the situation of Bolivia's indigenous majority population from a Marxist perspective. In García Linera's intellectual life, political questions have always been the most important. Upon his return to Bolivia, he became a founding member of the indigenous Marxist guerrilla organization EGTK (Tupac Katari Guerrilla Army), which disbanded when its leadership was captured in the early 1990s. After five years in prison, García Linera joined the sociology department at La Paz's public university. He quickly emerged as one of Bolivia's leading public intellectuals and stayed at the university until 2005, when he became Evo Morales's running mate in the presidential elections. Slender, light-skinned and tall, bundled into a Russian great coat that President Morales brought him back from Moscow, and armed with a cup of coca tea in one hand and the ubiquitous cellphone in the other, García Linera wasted little time in formalities when we sat down to talk recently. Can you describe the differences between what you call Andean-Amazonian capitalism and capitalism in Northern countries? How do you see the link between this kind of capitalism and socialism? Sometimes I am accused of going back on my Marxist principles when I raise this issue. But really what I am talking about is the reality of Bolivia. Not what we might want it to be, not what our idealism makes us want to believe, but what it really is. This is a country of small producers and family enterprises. However, it is also a country of deeply entrenched communitarian systems and relationships, although these have been weakened in the past sixty years. We believe that by strengthening these, we can gradually transition toward socialism. It is not realistic to think that in a country where only 10 percent of the working class has a clear consciousness of itself as a class, we can build socialism, because socialism cannot be built without a proletariat. It will take decades of hard work to build the class consciousness necessary for this transition. Therefore we must construct a strong state that assumes a leading role in the economy and mobilizes its resources to strengthen community organizations and communal forms of production. Since 2005, the Bolivian state has received a huge increase in income from natural gas. Can you describe how this has expanded the options available to your government? Natural gas now comprises about one-third of government revenues, and we are spending it on new social programs such as a small old-age pension, a benefit to encourage school attendance, and funds for pregnant and lactating mothers. It is peculiar -- in Northern countries, these types of benefits are viewed as a normal part of the state's role, but here we are accused of instituting them to buy votes. Under neoliberal administrations, the government's take of hydrocarbon profits was about 38 percent. Now it is between 75 and 83 percent. The downside to this significant increase is that we have suffered a sharp drop in foreign investment. But even with the recent fall in commodity prices, the government still earns more than before. We remain a dependent country in the global economy, but with the gradual nationalization of strategic resources we have regained some degree of sovereignty. Now, if the United States threatens to cut off international aid, we are concerned, of course. But our programs are not completely crippled as they previously would have been. We have other options, both our own resources and support we have developed from other parts of the world. On the other hand, we are acutely aware that we need to use increased government resources to invest in productive projects to develop Bolivia economically. Some 38 percent of our population lives in extreme poverty and over 60 percent is poor. Only by stimulating economic growth can we significantly improve living standards. One significant initiative we have undertaken to achieve this is the Development Bank for Production, which provides credit to those who didn't have access to it before. Your government has been criticized for relegating gender equality to a secondary position. How do you respond to this concern? Very early on we discussed gender inequality at the highest levels of government. We agreed that you can either opt for an understanding from a minority perspective or a majority one. It turns out that gender inequity is quite similar to the discrimination faced by indigenous people. During previous governments, a special ministry was established for indigenous groups. But why should the majority of the population be relegated to just one ministry? The same is true of women. Why should they be treated like a minority when they are, in fact, the majority? We believe women should be present in every level of government according to ability. Our first minister of government was a woman, and this is a position that is always perceived as requiring a strong and authoritative man. So we feel that by having women stuck off in a ministry or vice-ministry, we are marginalizing them. Just like indigenous people, women should participate fully. How do you explain the current dramatic decline in the influence of the right wing in Bolivia? It is always extremely dangerous to revel in any victory over the right. They are more than capable of regrouping, seizing power and reimposing their agenda. After they were weakened by our electoral victory, we were initially pretty successful in avoiding confrontations. 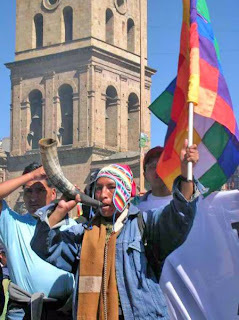 That changed dramatically toward the end of 2006, when we began to threaten their entrenched privileges, specifically mobilizing to break up the huge landholdings in eastern Bolivia. They latched on to the issue of regional autonomy, which stems from longstanding and legitimate demands in the country's regions, but distorted it to convince people to support their attempts to undermine our popularly elected government. They tried to destabilize us by blocking food supplies, inciting racism and attacking the National Assembly convened to develop a new, more inclusive constitution. As they gained ground, we discovered evidence that the US Embassy was actively supporting them, which gave us little choice but to insist that Ambassador Phillip Goldberg leave the country last September. At first, we responded to the right-wing resurgence rather passively, believing that they would trip themselves up, which is, in fact, exactly what happened. Their initial misstep was the recall referendum they demanded for the president, vice president and departmental (state) prefects (governors) in August 2008--which we agreed to. The defeat of two right-wing departmental prefects, on the one hand, and the president and my resounding victory, on the other, decisively turned the tide against them. Then the massacre of indigenous marchers in the far north department (state) of Pando last September horrified the public so much that the right lost most of its remaining support. This is what I call a point of bifurcation, a time when a political situation comes to a head and significantly changes the future course. When we recognized last September that we were in such a moment, we seized the opportunity to retake the initiative. Since then, we have passed a new constitution, we are extending agrarian reform and we have instituted a plan to eradicate extreme poverty. Thinking about how different the world would be right now if someone with the intellect and humanity of Bolivian VP Linera or Pres. Morales were elected here in the USA. Just think...none of the millions--yes MILLIONS--murdered in Iraq, Afghanistan or Pakistan. Over 4000 US military dead would now still be alive, and hundreds of thousands not injured. The many trillions of dollars not blown up or wasted in support of the US' military industrial prison intelligence complex would be available for positive purposes. Real efforts could be made to combat global warming, rather than ignoring the problems. Universal health care could be available for all--a pull back from the abyss in many meaningful and life-sustaining if not enhancing ways. Instead, we have Bush, Clinton, Bush and Obama--all sell-outs to the corporate elite. Most people in the USA are fearful of the future--thanks to our leaders, past and present, who--during and since 9-11--have practiced terrorism on our population in a so-far-successful effort to manipulate and control us, while hidden in many ways our nation continues to expand our stolen and debt-financed empire. The newest controlling efforts are to terrorize us with a pandemic many believe to have been created in US government laboratories, so the world population can be thinned, concentrating even more wealth into the hands of the ever-wealthier elite. There has to be a better way, and I hope that fellow citizens of the USA will look toward the leadership of Bolivia to find that direction and to then copy it.